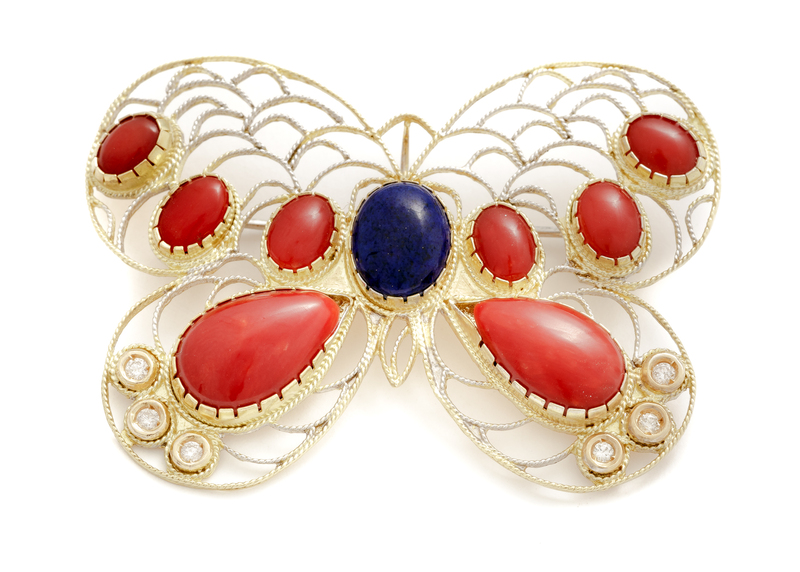 The light butterfly shape of this fine brooch is enriched by the elegant arched motif of the wings in red coral, lapis lazuli and diamond bezels. Made as a single piece it comes in different and customised versions. These fine earrings in red coral, white gold, sapphires and diamonds have essential and refined lines combining light shapes and elegant facets. Crafted as unique pieces with goldsmith techniques based on an exclusive design, they can be customised in features and original details. 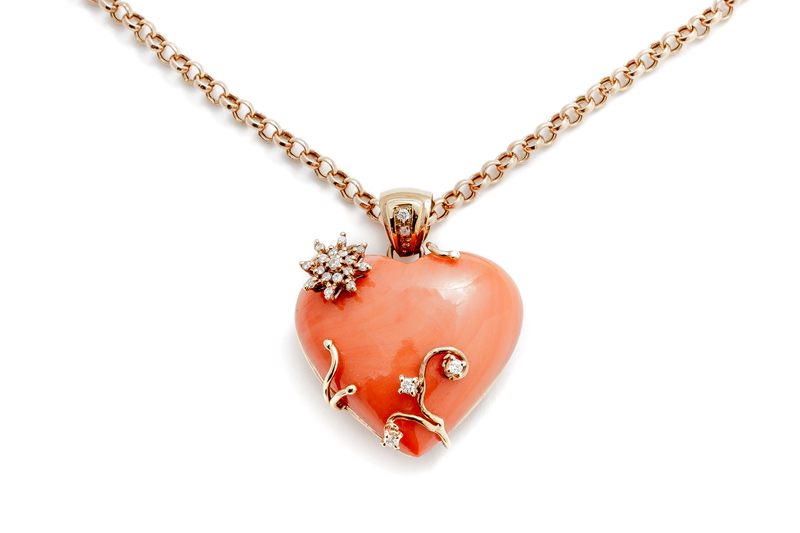 This fine heart in pink coral is artistically embedded in gold and diamonds elegantly composed so as to form delicate curls, a star-shaped flower and bright elements. 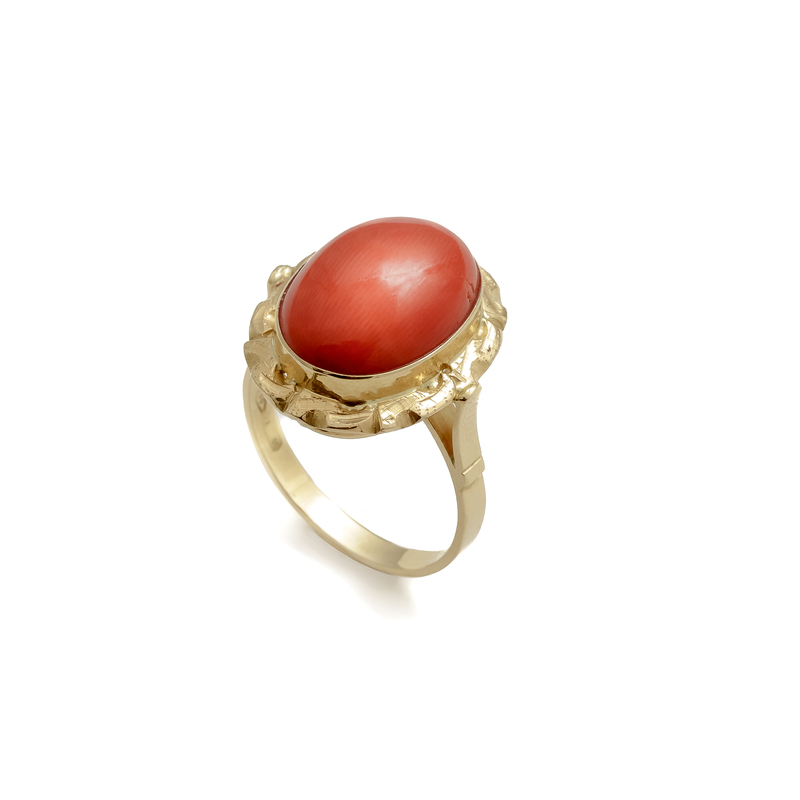 This elegant ring with a striking cabochon-cut coral bezel revives the jewels of the local goldsmith tradition. Entirely realised according to artisanal goldsmith techniques and coral cutting, it comes in ever-changing decorative details. 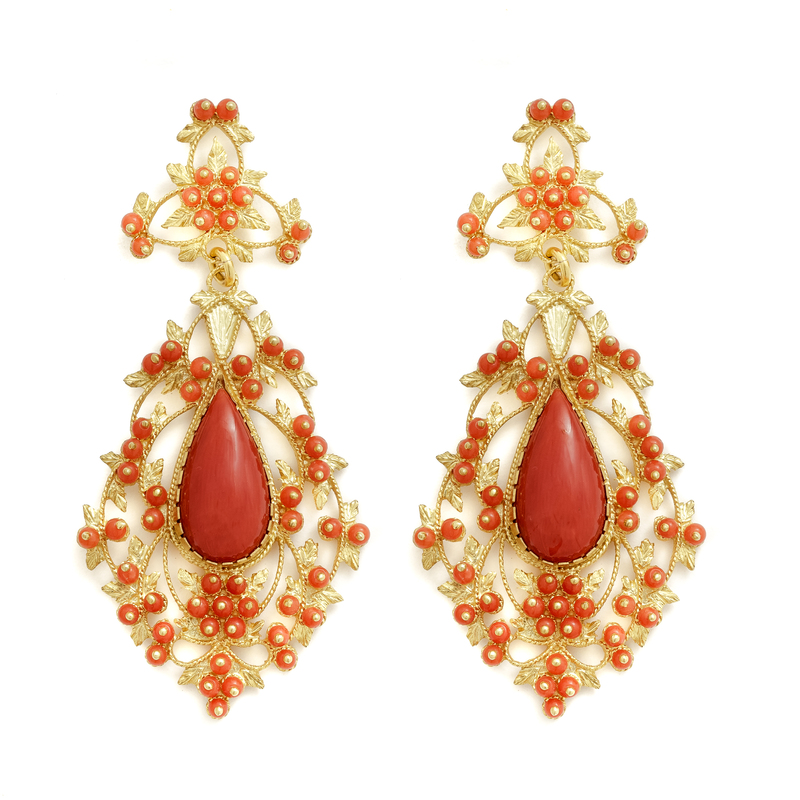 These sophisticated drop earrings in granulated filigree with drop-shaped bezels and coral beads stylishly enhance the local goldsmith tradition. Handcrafted, they come in ever-changing decorative details which can also be customised. 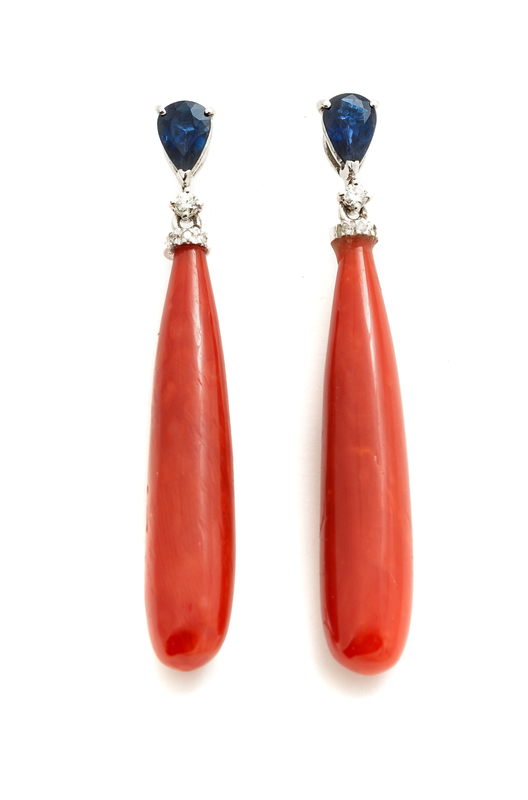 Sanna Gioielli’s refined and distinctive goldsmith production stands out for the expert use of finely crafted coral that draws on the consolidated knowledge of its charismatic nature, in exclusive striking compositions with gold and precious stones. Francesco and his brother Giovanni, sons of Anna Paola and Giuseppe, a fourth-generation coral craftsman who moved to Sardinia from Torre del Greco, grew up in the creative environment of their parents’ workshop in Oristano, a town known for its lively artisanal tradition. In particular, Francesco observed and experimented coral crafting and goldsmith techniques, revealing from the very start his artistic flair which he built on, specialising in the crafting of coral in Torre del Greco and in various goldsmiths’ workshops around Italy, the most representative of which was the workshop of a well-known master filigree goldsmith in Bosa, centre of excellence for this craft in Sardinia. After studying economics at one of the most prestigious Italian universities, the two brothers engaged in various tasks in the family workshop in Oristano, carrying on the well-established craftsmanship which is one of the main businesses for production and distribution of certified coral in the region. They participate in the main national and international exhibitions with an exclusive collection of fine craftsmanship and sensitive aesthetic taste. The goldsmith production of Sanna Gioielli counts exclusive artefacts characterised by the use of coral in various combinations and juxtapositions with metals and precious stones. Each creation, being the fruitful outcome of research and preliminary design, is conceived as a unique piece enhancing the precious aesthetic features of coral in its many colour variations, combining classic goldsmith techniques with the traditional filigree technique. The workshop performs all coral cutting and crafting techniques, classic goldsmith techniques and traditional filigree techniques.